Today we recieved a new system to enroll our Linux operating system on. It comes with two six core Intel Xeon processors with hyperthreading enabled. 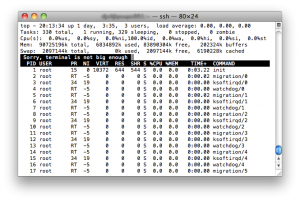 When the installation was finished I fired up top and switched to SMP view, which didn’t worked. It displayed the following message (have a look at the picture). 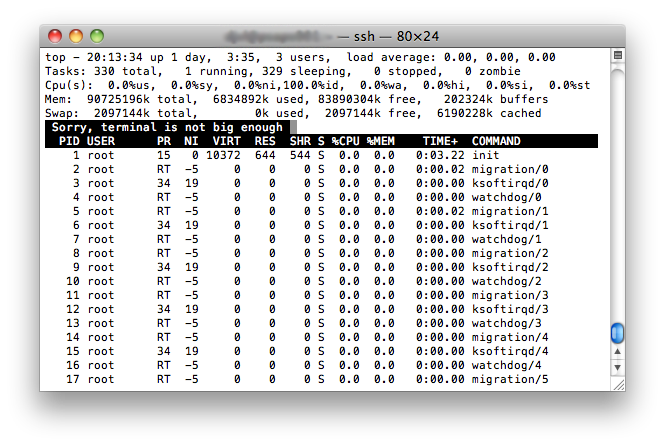 I had to enlarge the terminal to have all 24 cpu’s displayed. Too funny! Do we get ahead of Moore’s law? Today I encountered a strange problem when I tried making a phone call using my home VOIP telephone. I could dial out, but there was no sound coming through, which is pretty confusing.